GO TO iPLAY WITH TAG! - Packages with bus transportation have SOLD OUT! 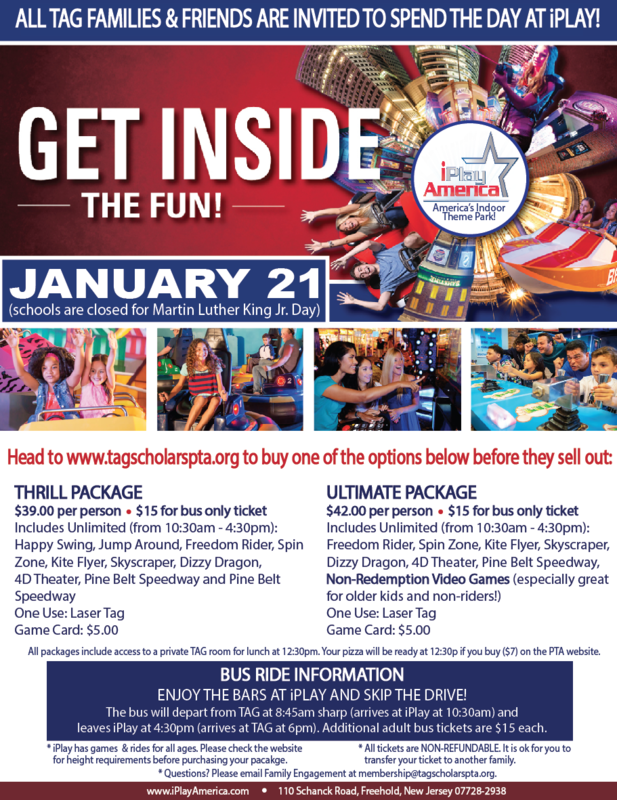 A limited number of packages without transportation are still available below for families who can get to iPlay on their own. - Packages with bus transportation are round-trip . The bus leaves TAG at 8:45am & returns at 6pm. - TAG families will have access to a private room for lunch at 12:30PM. If you'd like to have pizza ready for you at that time, please be sure to purchase it along with your ticket below. You can also get other items from the concession stands and bring to the room. The bus tickets have SOLD OUT! Ticket sales have ended. Please email Family Engagement with any questions.